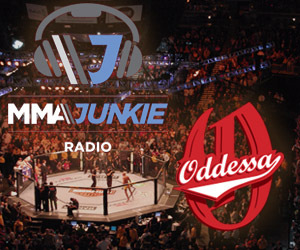 MMAjunkie Radio with guests Frank Mir, Herb Dean, Darren Elkins, Joey Oddessa and Richard Hunter. Oddsmaker Joey Oddessa, Mir talked about the preparations for his upcoming fight against Mark Hunt at UFC Fight Night 85 in Brisbane, Australia. Veteran referee Dean co-hosted the first hour and discussed his actions this past weekend in London at UFC Fight Night 84; UFC 196 this weekend, where he will handle the main event; and a few side projects he is involved with. Elkins spoke about his camp at Team Alpha Male in Sacramento and the coaches that will accompany him to the octagon Saturday against Chas Skelly at UFC 196. Hunter and Oddessa, along with Mir, joined the hosts to break down the top fights at UFC 196. Mir, Dean and Hunter were in-studio. | Title: MMAjunkie Radio with guests Frank Mir, Herb Dean, Darren Elkins, Joey Oddessa and Richard Hunter. | Fights: Kimbo Slice vs. Dada 5000 at Bellator 149.